Today’s WOVEMBER WORDS explores different regional cloaks traditionally made from 100% WOOL to protect Shepherds from the elements. Wearing Wool has historically been very important for Growing Wool! This suba is a traditional garment of Hungarian shepherds. The suba is awe-inspiring with its use of sheepskin in the body of the garment as well as the full black lamb pelt draped over the shoulders. The dense foliate embroidery and leather appliqués are characteristically Hungarian. Despite their grand appearance, subas served more than just festival purposes. For shepherds working outside they provided protection from weather, as well a seat or bed. The suba also served as a surface for eating or drying meat. 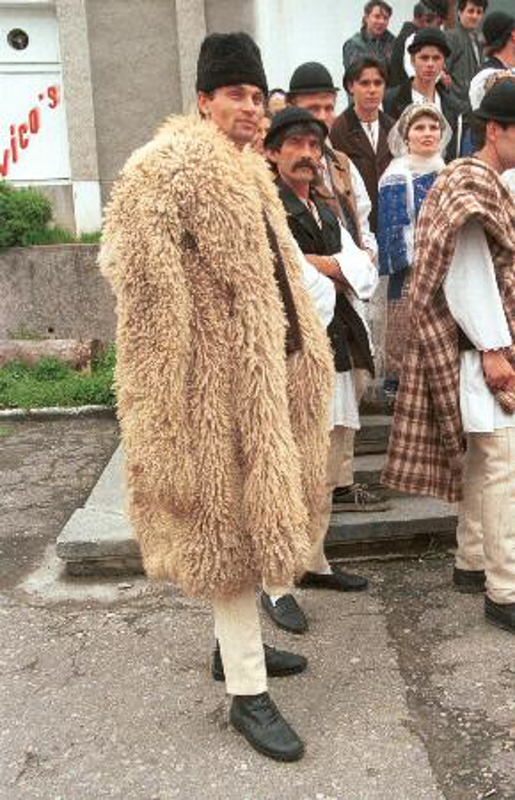 Shepherds cloaks (sarică or bituşca) are worn by shepherds in the Southern Carpathians. These are made of three or four sheepskins and are worn fleece outside in Romania. Sarice can be calf or ankle length and are either sleeveless or have long sleeves, which are left free and are used by the shepherd as a pillow when sleeping outside. These can also be made of woollen material with long tufts of wool. This type is worn around Făgăraş. 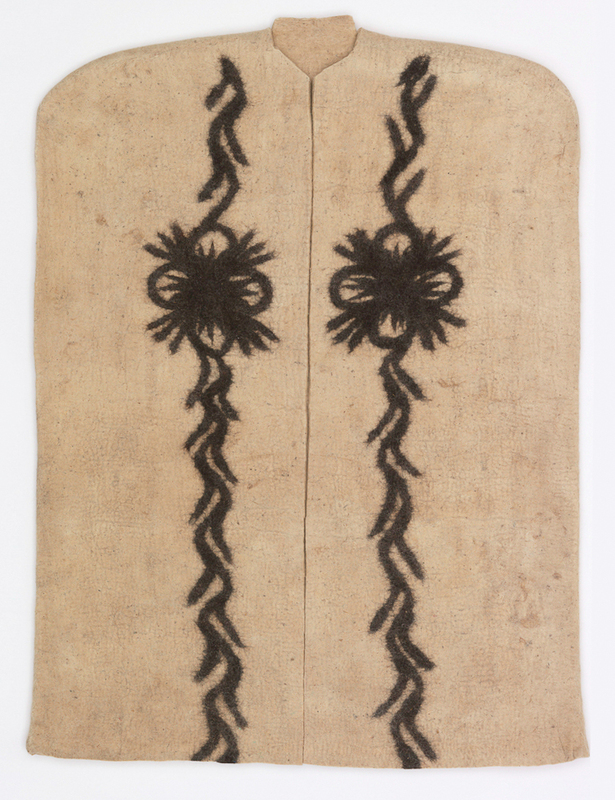 Similar sheepskin cloaks were found in Hungary but were usually worn fleece inside with the outside being decorated with embroidery and appliqué leather. This is a Kepenek (shepherd’s cloak). It is dated 2008 and we acquired it in 2009. Its medium is wool and its technique is felted. It is a part of the Textiles department. 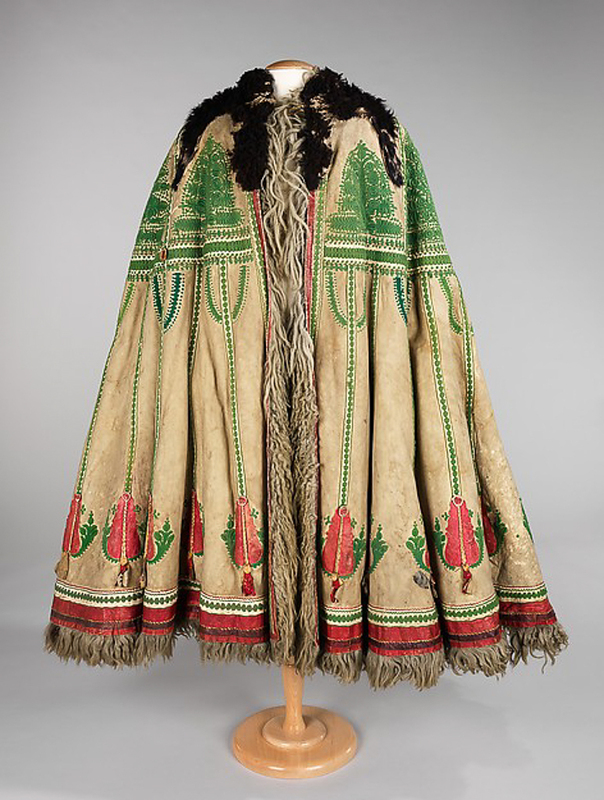 There is no scholarly consensus on the earliest use of the kepenek, or shepherd’s cloak, but Veronika Gervers of the Royal Ontario Museum, who wrote extensively on both traditional felt-making practices and the coats, mantles and cloaks of Central Asia, suggests that the form has been in use since at least the Middle Ages. Felt is considered to be the earliest man-made fabric, and was critical to the survival of many early communities. There are regional variations of the kepenek: cloaks of the coastal region of Turkey have hoods, and some have sleeves; in Iran, the coats are made with the vestigial sleeves typical of Persian ceremonial garments. Historically, colored markings on the front of the typically white cloak included the symbol of the local felt-maker’s guild, along with the weight of wool used in making the piece to indicate its quality. Later, as the guilds were disbanded, individual felt-makers embedded their names and sometimes the name of the person commissioning the garment. Today, one often sees a more decorative use of once-meaningful motifs. This piece, made in 2008 by Kececi Osman, a felt-maker in the Taurus Mountains near Konya, Turkey, has a form typical of the region in which it was made. The felted wool cloak has broadly rounded shoulders in natural wool white, with a pattern band down each side front in black, and an opening in the center front. The piece was commissioned for an exhibition by Mehmet Girgiç, a well-known felt carpet-maker in Istanbul. As a collection or exhibition object, the kepenek tells a rich story about the development of felt making alongside the early domestication of animals in Central Asia, the daily life of nomadic herders and, most importantly, the role of textile architecture among nomadic communities, as this unfitted garment can serve as a portable, wearable tent. Please tell WOVEMBER of any other types of shepherd’s cloaks of which you know so that we can keep adding to the collection! It’s exciting to trace the influence of these traditional garments on contemporary designs such as The Lookerer’s Cloak by Nazare Soares and garments hailing from the Burel* factory in Portugal.